Rally outside Metro headquarters this morning. 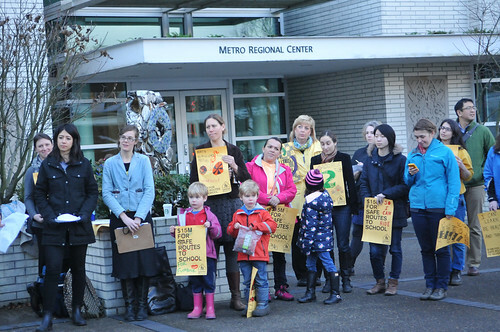 For Every Kid, a regional coalition that wants more money for biking and walking infrastructure around schools, made their strongest statement yet when they brought their message to Metro’s regional headquarters this morning. At their monthly meeting in April, Metro’s Joint Policy Advisory Committee on Transportation (JPACT) will decide how to spend an estimated $125 million in regional flexible funds. 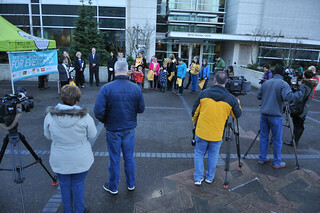 This coalition — which includes the Bicycle Transportation Alliance, the American Heart Association, the Community Alliance of Tenants, the Community Cycling Center, Oregon Walks, Upstream Public Health, and others — is asking JPACT to allocate $15 million of those funds to spread the Safe Routes to School program across the region. The $15 million ask is a bold move because competition for these flexible funds (so named because they come from federal sources not tied the Highway Trust Fund and can therefore be spent on anything) is fierce. The For Every Kid coalition has support from several state legislators and hundreds of families and kids from all over the region. 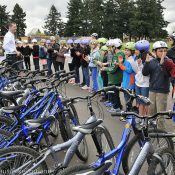 The Bicycle Transportation Alliance has made expansion of the Safe Routes program one of their five main advocacy campaigns and they’ve tapped into partnerships at schools throughout Portland for support. 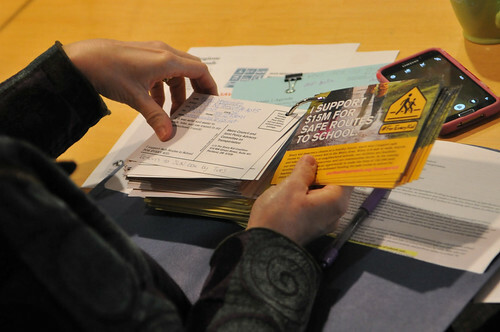 JPACT member and Metro Councilor Kathryn Harrington flips through a stack of postcards in support of Safe Routes to School. Velia Mendoza and her daughter Karen addressed JPACT members (through translator Lale Santelices). The rally outside the JPACT meeting. Metro typically allocates this pot of money in two phases: Step 1 ($75 million) and Step 2 ($50 million). The For Every Kid coalition is focused on Step 1 because that’s where allocations are made to region-wide, programmatic investments as opposed to infrastructure projects, which get funded in Step 2. JPACT is made up of county and city commissioners, agency leaders, mayors, and other elected officials from around the region. 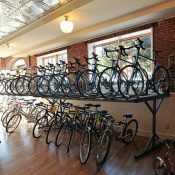 For them to support this $15 million they would have to make a stand for Safe Routes funding and possibly take money away from other funding set-asides that include paying down bonds for past transit investments, general planning costs, and Metro’s travel option education and transit-oriented development programs. While JPACT will make a recommmendation about how these funds should be spent, the seven-member Metro Council will make the final decision. Metro Councilor Bob Stacey spoke at the rally. If JPACT doesn’t OK the $15 million, the Metro Council could overrule them. It’s rare and unlikely Metro would go against their own advisory committee; but it’s certainly possible. For Every Kid would only have to convince three of the remaining six (after Stacey) Metro councilors to join them. Given past records and general interests, it seems like Sam Chase (who joined me for a European bike study tour in 2013), Kathryn Harrington (who took video with her phone of Ms. Mendoza’s testimony), and Carlotta Collette might be sympathetic. The BTA’s Advocacy Director Gerik Kransky has been in the trenches of these funding negotiations for years. He knows how hard it will be to get JPACT’s support this time around. “We’re pushing for something that’s big and new and we’re going to have to create a lot of space in the politics,” he shared with us in a recent interview. 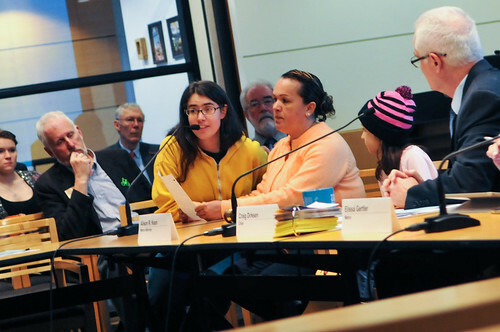 The For Every Kid Coalition says this dedicated, multi-year funding is necessary so planners and school officials can build Safe Routes programs and maintain them for the long-haul. Their plan would prioritize schools in low-income areas and invest in infrastructure imnprovements within a one-mile radius of the campus. 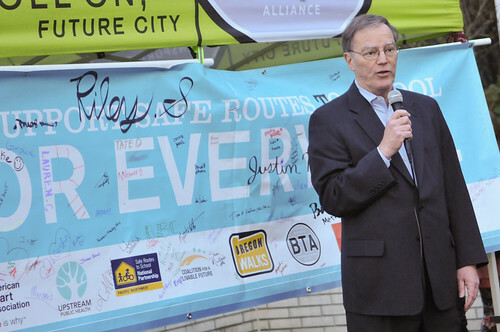 Those infrastructure investments would be complemented by education and encouragement programs — all of which are needed to realize the potential of Safe Routes to School programming. 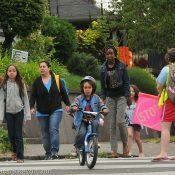 As we just reported, Safe Routes is moving the school transportation needle in the Portland area. But much more investment is needed to continue that upward trajectory. The BTA has put out an action alert urging members to contact JPACT members and Metro councilors. JPACT is expected to make their decision on April 21st. Glad to see that these funds would go towards building safe infrastructure, rather than “pedestrian safety classes” and hi-vis vests for children. Not to discount the value of building safe infrastructure, but aren’t Pedestrian Safety Classes valuable for younger students? Safe Infrastructure isn’t going to appear overnight so teaching kids how to safely walk to school during that transition seems like a good use of resource. Additionally, I’ve noticed quite a few kids wearing hi-vis hoodies on my ride to work. I’m not sure if it’s popularity is kid-driven or parent-driven but it’s a good idea either way (not that it should be required). Back in my elementary school days, my school required a yellow backpack cover and yellow hat for 1st and 2nd graders. p.s. I’ve taught Safe Routes to School and it’s definitely one of the most satisfying jobs I’ve had. It’s reassuring to see so many supporters for the program! I am sure the education classes provide some value, and I thank you for providing this service to the community. However, I am wary of placing the responsibility of safety upon the vulnerable user, rather than the party capable of causing harm. Hi-viz is a symptom of this problem, and is a suble way of blaming the victim. We shouldn’t have to deck ourselves and our kids in flashing lights and bright colors just to walk somewhere. Safety on the streets is a shared responsibility. Motorists, cyclists, and pedestrians can all to something to contribute to a safer environment for all. When I choose to wear clothing that makes me more visible to motorists, I’m not playing the victim, I’m being actively involved in promoting my safety. Sure, I rely on motorists to do their part too, but the responsibility for promoting safety should be shared. Asking potential victims to take control of their own safety may be well-intentioned, but only serves to preserve the dominance of the mode responsible for the vast majority of the violence. 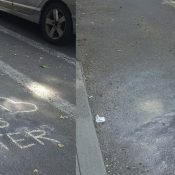 People walking or cycling and people driving are not on equal footing, safety wise, so the person driving must bear the greater responsibility for safety. You wouldn’t ask people to wear bullet-proof vests to avoid gun violence. Why is it okay to question the fashion habits of victims of traffic violence? So your recommendation is for parents to send their kids out in dark colored clothes in order to make a political statement? Makes perfect sense. I think it’s clear that Adam’s message is to policymakers choosing whether to fund potential-victim-focused education, or infrastructure that protects the potential victims. Personally, I think education is important, but I don’t trust the current system to focus sufficiently on avoiding killing or maiming other people.